The design of the Infinity L2-Series covers a wide range of cyclists Similar to the Infinity N-Series, the L2-Series seat will allow cyclists to feel the road and also the fluidity of the peddle stroke. For many the padding of the L2-Series allows for riding with only a training short. You can choose your comfort level. Here’s how it works: The revolutionary Infinity Seat design relieves pressure on your sit bones and pubic bone. All points of contact are with areas of your anatomy that “provide their own padding”. Ten-Point is the European Academy for the most Advanced Bike Fitting System in the world and is also the European Training Centre for Dan Empfield’s Slowtwitch F.I.S.T Bike Fitting Protocol. We spend much of our time either teaching or bike fitting and one of the most common problems that we encounter is saddle discomfort. In general saddle discomfort can be categorised into three areas. You may experience one or all of the above. We all know that when you do your mind becomes focused on that area for the entire ride and completely diminishes the enjoyment of that ride. How many times have you said, to yourself, I can’t wait to get off this saddle? Unfortunately most of us tolerate or persevere. If you do some research you will discover that cycling has also been linked with erectile dysfunction and an increase risk of prostate cancer. However, the evidence is tenuous and certainly not conclusive. Neurovascular problems arise when you compress the pudendal nerve and the associated blood vessels in that area. This causes the dreaded numbness. One study published in the Journal of Sports Medicine stated that 61% of male cyclists suffered from genital numbness and a further 19% suffered from Erectile dysfunction. 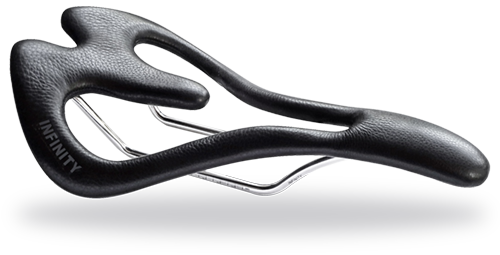 Over the last five years saddle manufacturers have made many attempts to develop saddle designs that alleviate or eradicate some of the above issues. However, given the prevalence of saddle discomfort these attempts have not been successful. In every industry there comes a game changer. A manufacturer who disregards the existing rules and designs something from a completely different perspective. Welcome Infinity Saddles. Designed by Doctor Vince Marcel, an American Chiropractor who suffered from the above he decided to think outside the box. In doing so he developed a saddle that is arguably the most comfortable saddle ever made but more importantly addresses some of the main issues of saddle discomfort. As soon as you see it makes anatomical sense. At Ten-Point we consider that Infinity Saddles have taken bike saddles to the next stage of saddle development. If you are unsure due to the price you can currently hire one from Ten-Point.